This was my favorite project of the year. I gathered an exceptional team and arranged a shoot in the Detroit Metropolitan area – at a park. 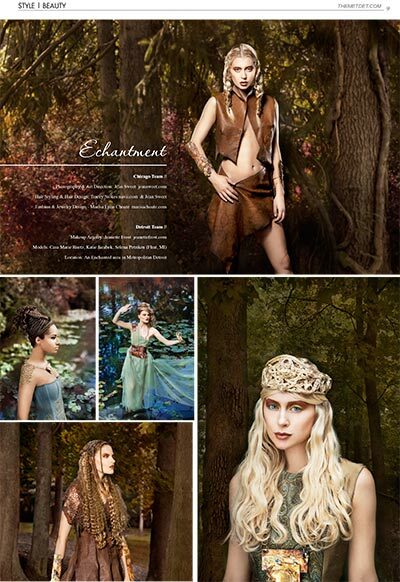 I had a vision of creating a fantasy of enchantment – in the woods, inspired by medieval folklore. Tracey Stokes, hairstylist and salon owner of Navii Salon Spa, worked with me on all the hair artistry. We worked on hairpieces before the shoot that were then integrated with the hair styling done at the shoot. The princess crown is made totally from hair! Marisa Choate designed and constructed the costumes and jewelry for the project – truly works of art. Friend and makeup artist Jeanette Frost did the casting for the models and designed beautiful makeup looks to go with the theme.